It really doesn’t matter how old you are – folding and throwing a paper airplane is pure, gleeful fun. 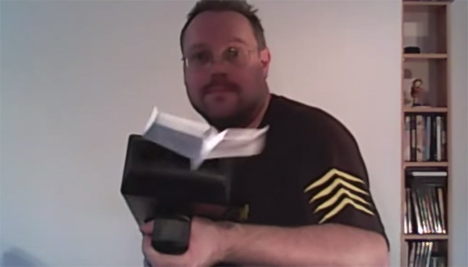 But there’s also something pretty great about being able to feed regular paper into a device that folds paper airplanes for you and then shoots them out machine gun-style. 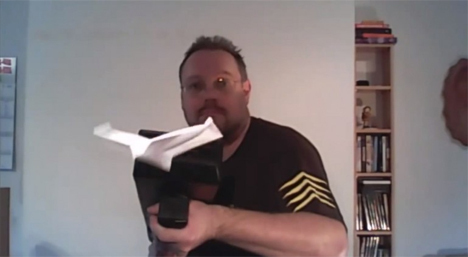 A German YouTube user who goes by the name Papierfliegerie (the German word for paper airplane) shared a video of a 3D printed paper airplane machine that he created. 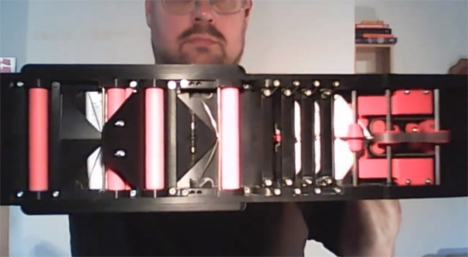 He had most of the parts custom printed from a 3D printing service and purchased the rest online or at a hardware store. The motor that makes the whole thing function was scavenged from a cordless screwdriver. As the video shows, the machine contains rollers to move the paper through it and small ridges that manipulate the paper into perfect flying form. And one by one, an entire fleet of paper airplanes comes shooting out. As an added bonus, it’s a much faster way to deliver your TPS reports to your boss than walking them over – and if you have good aim, the sailing papers will hit your boss square in the head. See more in Do It Yourself or under Technology. October, 2014.